What's baffling about this one is that obviously the flying squirrel merely used that hole, rather than gnawed it. It's not a gnaw hole. So how did it get there? 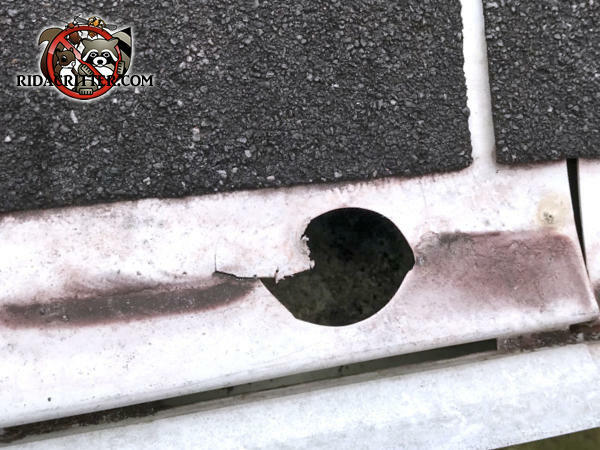 Possibly the gutter cover is old and brittle and something like a nut fell on it, cracking the plastic; but that's only a guess. Truth be told, I have no idea how that hole got there. I suspect the flying squirrel didn't, either. But unlike me, it didn't spend much time puzzling over it. To learn more about flying squirrel removal in Metro Atlanta, please click here.